Not to be confused with United States Senate special election in Pennsylvania, 1814. After the resignation of Democratic-Republican Sen. Michael Leib in February 1814, fellow Democratic-Republican Jonathan Roberts was elected by the General Assembly in a special election to fill the vacancy and serve out the term ending on March 4, 1815. This election, held in December 1814, was the regularly scheduled election to elect a Senator to serve the term beginning upon the expiration of the previous term. ^ a b "U.S. Senate Election - December 10, 1814" (PDF). Wilkes University. Retrieved December 21, 2012. 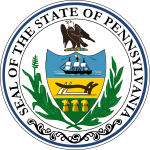 ^ "PA US Senate - 1814". OurCampaigns. Retrieved December 21, 2012.